MOUNT JULIET, Tenn. (DTN) -- Brazilian grain export facilities along the Amazon River are picking up a larger share of the country's growing exports, and waterways are playing a larger role in carrying corn and soybeans to port. Between 2010 and 2017, Brazilian exports of corn and soybeans increased by 145%, climbing to 97 million metric tons, the equivalent of nearly 3.6 billion bushels, according to a new report by Rabobank. Over the past seven years, the share of exports from ports north of the 16th parallel -- which Rabobank refers to as Northern Arc ports -- grew from 15% to 27%, and there's plenty of room to keep growing. "I believe most of these ports are being underused compared to the total capacity," Rabobank Grains and Oilseeds Analyst Victor Ikeda told DTN by telephone from Sao Paulo, Brazil. "Our production is getting closer to the northern ports, so our farm gate prices for the frontier are relatively higher in comparison to some traditional regions in the center west of Brazil." Ikeda said crop production is increasing in the state of Para, along with the Matopiba region, made up of the states of Maranhao, Tocantins, Piaui and Bahia. Just like in the United States, this region's proximity to ports lowers transportation costs, giving farmers a better price than in other areas, which also helps motivate expanded production. 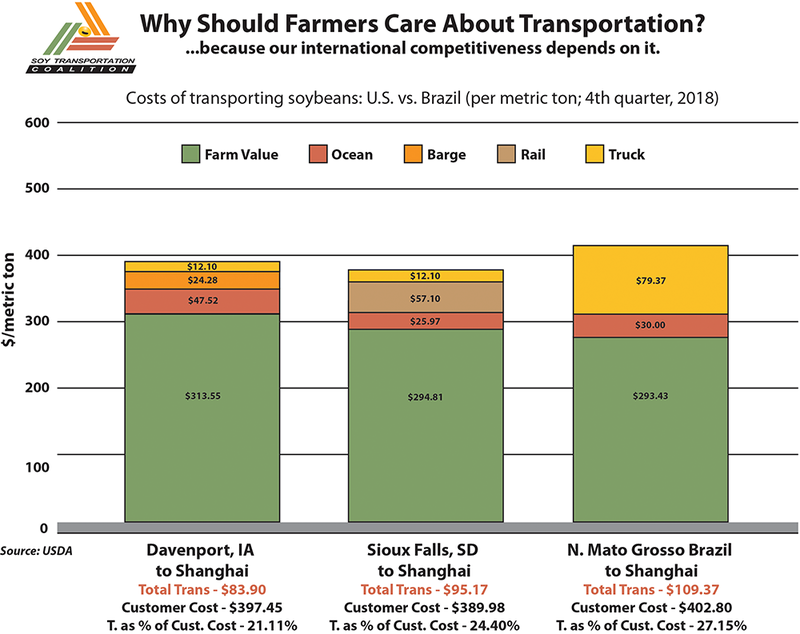 The ports' excess capacity and proximity to areas where soybean production is on the rise could give Brazilian farmers an edge, but it comes down to infrastructure investments. Between 2010 and 2016, the Brazilian government invested the equivalent of $22 billion dollars in highways and roads, $13.5 billion in railways and $4.5 billion in waterway infrastructure. "The pace of this investment, especially when you consider inland transportation, I think will be crucial to transform this potential competitive advantage into a real competitive advantage," Ikeda said. Mato Grosso's northern region is a prime example of why Brazil needs to focus on its inland infrastructure. While it's almost twice as far to ship grain to the southern ports, the transportation cost is similar. Ikeda said it could be 20 to 30% cheaper to ship corn and soybeans north if the journey wasn't as risky and rugged. One of the primary roads connecting the northern port of Santarem to Mato Grosso is BR 163. Sixty miles of it is still unpaved, creating dangerous conditions during the rainy season. Ikeda said grain-trading companies and others are pressuring the government to finish paving the road, but they're also looking at alternative ways to get grain to export facilities. In the Northern Arc, that increasingly means by barge. Nearly 14% of grain exported in 2017 arrived at ports via barge, up from just 6% in 2010. Brazil has a number of projects in the works to the increase the efficiency of its transportation system. For example, a new line of the North-South railway will connect northern Mato Grosso to a waterway in the state of Para, cutting down on the number of miles beans have to travel by truck. Rabobank analysts say they expect Brazil's soybean exports to increase by 40% to 90 mmt (3.3 bb) by 2026, and they expect exports from Northern Arc ports to increase by at least 130% over the next decade. Ikeda said he thinks barge and rail will play a bigger role ferrying crops to port, but infrastructure needs more investment before it becomes a strong advantage for Brazilian farmers.